On September 15, 2011, Noam Chomsky shared remarks on the pitfalls of humanitarian intervention with the Williams College community. 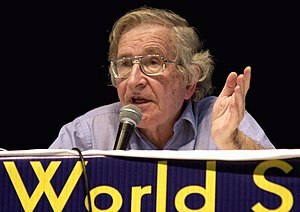 A prominent American public intellectual and activist, Chomsky has written and lectured extensively on linguistics, philosophy, intellectual history, international affairs, and foreign policy. His remarks kicked off the 2011 Williams College Class of ’71 Public Affairs Forum, a series of lectures throughout the fall semester that focus on humanitarian concerns, human rights, and different approaches to direct action around the world. For more about the Class of ’71 Public Affairs Forum go to http://bit.ly/pi6yIM. This entry was posted in All Posts News Politics and-or Videos, Dandelion Salad Videos, Death-destruction, History, Human Rights, Imperialism, Military, NATO, Politics, Terrorism, War and tagged Cold War, Noam Chomsky. Bookmark the permalink.